The Big Dipper Like You’ve Never Seen It Before! All right, it may look just like any other picture you’ve ever seen of the Big Dipper. Maybe even a little less impressive, in fact. But, unlike any other picture, this one was taken from 290 million km away by NASA’s Juno spacecraft en route to Jupiter, part of a test of its Junocam instrument! Now that’s something new concerning a very old lineup of stars! The image is a section of a larger series of scans acquired by Junocam between 20:23 and 20:56 UTC (3:13 to 3:16 PM EST) on March 14, 2012. Still nowhere near Jupiter, the purpose of the imaging exercise was to make sure that Junocam doesn’t create any electromagnetic interference that could disrupt Juno’s other science instruments. In addition, it allowed the Junocam team at Malin Space Science Systems in San Diego, CA to test the instrument’s Time-Delay Integration (TDI) mode, which allows image stabilization while the spacecraft is in motion. Because Juno is rotating at about 1 RPM, TDI is crucial to obtaining focused images. The images that make up the full-size series of scans were taken with an exposure time of 0.5 seconds, and yet the stars (brightened above by the imaging team) are still reasonably sharp… which is exactly what the Junocam team was hoping for. “An amateur astrophotographer wouldn’t be very impressed by these images, but they show that Junocam is correctly aligned and working just as we expected”, said Mike Caplinger, Junocam systems engineer. These images will be used to further calibrate Junocam for operation in the low-light environment around Jupiter, once Juno arrives in July 2016. Read more about the Junocam test on the MSSS news page here. 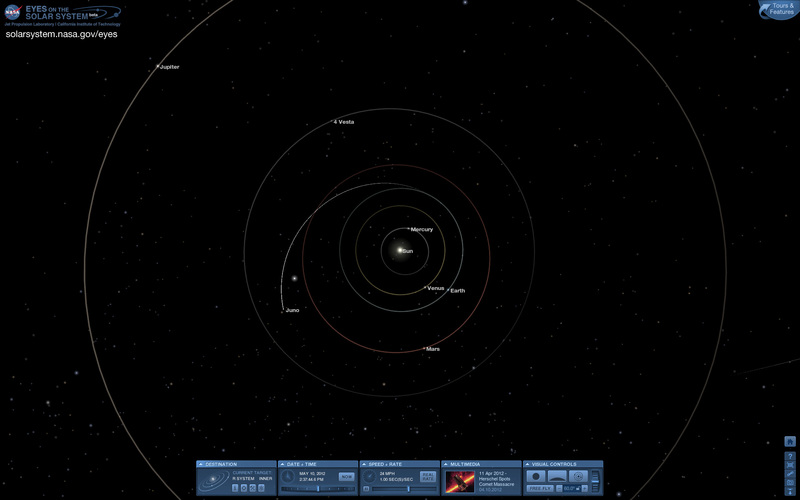 As of May 10, Juno was approximately 251 million miles (404 million kilometers) from Earth. Juno has now traveled 380 million miles (612 million kilometers) since its launch on August 5, 2011 and is currently traveling at a velocity of 38,300 miles (61,600 kilometers) per hour relative to the Sun. Watch a video of the Juno launch here, taken by yours truly from the press site at Kennedy Space Center! dsfsdafSpammer Please Flag !!! !Spammer Please Flag !!! !Spammer Please Flag !!! !fsdfSpammer Please Flag !!! !Spammer Please Flag !!!! Can’t seem to make out 4th magnitude Alcor, near Mizar, in the handle.